WHAT: Actress, Lindsay Price, celebrates the exclusive Grand Opening of Laguna Champagne Bar at The Palazzo. After a red ribbon cutting ceremony with Lindsay Price and Sebastian Silvestri, Vice President of Food and Beverage at The Palazzo and The Venetian, guests will enjoy an evening of champagne cocktails and glasses of Dom Perignon. Laguna Champagne Bar is the perfect place to enjoy a premium beverage in a luxurious environment precisely for the most distinguished beverage connoisseur. Laguna brings a menu of various classic champagne cocktails and elegant entertainment. WHEN: Saturday, January 30, 2010, 9:00 p.m. The Venetian and The Palazzo will celebrate Chinese New Year and the Year of the Tiger with an authentic dragon and lion dance with firecrackers and festive decorations featuring a 16.5-foot long Tiger and Chinese Bridge in the atrium gardens of The Shoppes at The Palazzo with citrus trees representing good luck and fortune. The dragon and lion dance symbolizes good luck and prosperity for the year to come and is an important ritual of Chinese culture. The Chinese consider dragons to be friendly and helpful creatures associated with strength, good fortune, wisdom and longevity. Lions are traditionally seen as guardians and are used to exorcise evil spirits and summon luck and fortune. 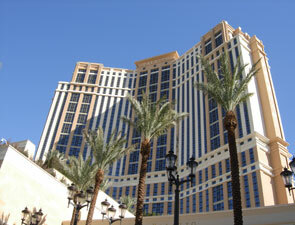 On Saturday, February 13th at 3 p.m., a ceremonial dragon and lion dance, complete with firecrackers and eye painting ceremony, will begin at The Venetian’s lavish Porte-Cochere, making its way through The Venetian Casino, into The Palazzo Waterfall Atrium, through The Palazzo Casino and end in the upper Palazzo Porte-Cochere. The colorful spectacle will feature a parade of dancers and musicians dressed in elaborate costumes playing authentic music. One additional dragon dance, minus the eye painting ceremony, will be held on Sunday, February 14th at 1 p.m. beginning in The Venetian Porte-Cochere, make its way through the casino into The Palazzo Waterfall Atrium and ending in The Palazzo Porte-Cochere. All dragon dances will be open to the public. The décor throughout both The Venetian and The Palazzo will include presentations of citrus trees, red envelopes and lanterns to celebrate the New Year. The Venetian reception desk wall will feature an ornate red silk taffeta drapery treatment with ornate I-Ching coins. The Venetian’s lobby will feature red, orange and yellow floral to complement the banners and lotus lanterns hanging in The Venetian Colonnade. 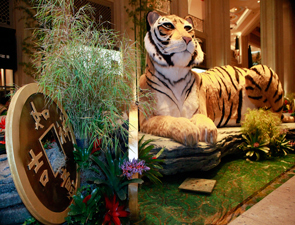 A 16.5-foot long custom-designed Tiger, the auspicious zodiac symbol of 2010, will be situated at the water feature facing The Palazzo casino floor to welcome visitors. Six-foot custom-made red, orange and yellow lanterns that will be hung to signify the lives of our guests will always be bright and full of lights. The atrium gardens will be redesigned into an Asian garden with red, orange and yellow floral including Mums, Orchids, Bromeliads, Kalonchoes and feature a ChineseBridge with 35-foot bamboo. Throughout the atrium gardens there will be arrangements of over-sized bamboo towers with fresh orchids and lanterns. The waterfall wall will be adorned with ceremonial accent décor. The columns in The Palazzo lobby surrounding the Aqua di Cristallo statue will feature a sophisticated red taffeta fabric treatment, tangerine trees and bundles of gold I-Ching Coins representing an “abundance of wealth.” The main entrance to The Palazzo will also be decorated with I-Ching coins in multiples of eight welcoming good fortune to guests. The Palazzo lobby includes custom bamboo towers and bamboo floral centerpieces created specifically for The Palazzo by a bamboo artist. Decorations celebrating Chinese New Year will be presented through the third week of February. 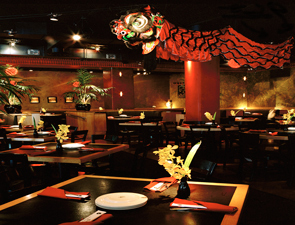 For Zine Dim Sum Restaurant’s Chinese New Year’s Menu, click here. For the full listing, please click here. Nove Italiano inside Palms Casino Resort invites wine connoisseurs to experience a one-of-a-kind wine dinner featuring Husic Vineyards at 7 p.m. on Thursday, Feb. 25. Executive Chef Geno Bernardo dishes up a mouthwatering six-course menu which will be paired with a variety of wines from Husic Vineyards, a family-owned winery located in the heart of Napa Valley, Calif. The Husic wine dinner is priced at $150 per guest, excluding tax and gratuity. Seats are limited. 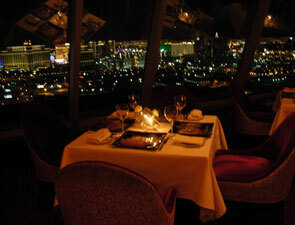 For reservations, please call 702.942.6856. Poached eggs aren’t just for breakfast anymore. Once plain, now they’re posh, thanks to creative chefs who’ve reinvented them by pairing them with delicacies like caviar and lobster, resulting in diverse dishes suitable for any meal. For the best breakfast - any time of day - TravelsinTaste.com asked the nation’s top chefs to share their most popular poached plates. You can read our entire story at Forbes.com. NYC Restaurant Week is Here! NYC Restaurant Week is Here! Starting today through February 7th (Saturdays excluded, Sunday participation optional) you can get three course $24.07 prix fixe lunches and $35 prix fixe dinners at some of New York City’s best restaurants. This year’s participation includes 21 Club, Aldea, Michael Jordan’s The Steakhouse N.Y.C., Rouge Tomate, and SHO Shaun Hergatt, among many other. 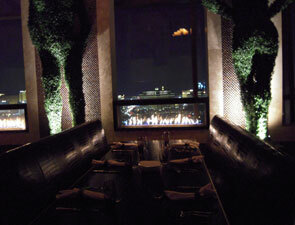 For a listing of our favorite menus please click here. Beginning on Thursday, January 21, Klee Brasserie is presenting a very special 4-course menu of the rare Mangalitsa pork. The 4-course menu and Mangalitsa a la carte items will be offered for as long as it lasts. …bred during the Austro-Hungarian Empire for its exquisite flavor only the Hapsburg royal family was allowed to eat Mangalitsa! 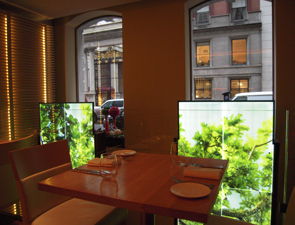 Rouge Tomate, a Michelin star rated Manhattan restaurant and a proud member of the Green Restaurant Association, announced today a new February promotion, Sweet Love Saturdays and a partnership with Divine Chocolate. Beginning on Saturday, February 6th and continuing until Saturday, February 27th, those who dine at Rouge Tomate on Saturdays, will receive a special box of Divine Chocolate and Passion Fruit Truffles as a gift from Executive Pastry Chef, James Distefano to take home. Thanks to Valentines’ Day, February is the month of love. However, now it’s also the month to celebrate our love of doing the right thing. Divine Chocolate is an eco-friendly cooperative of cocoa farmers in Ghana in which the local workers own shares in the company. Divine Chocolate’s fair trade practices ensure that profits from the company benefit cocoa farmers in West Africa in real and sustainable ways. But of course, it’s not just the story that’s deliciously sweet, it’s the chocolate too! In addition to the specially made truffles, Rouge Tomate is also taking reservations for a very romantic Valentine’s Day dinner on Saturday, February 13th. Located in the heart of Manhattan at 10 East 60th St. between Madison and Fifth Avenue, Rouge Tomate will be offering their traditional a la carte menu under the direction of Executive Chef Jeremy Bearman as well as a special $85 chef’s choice menu including 5 courses and champagne. Complimentary roses and the Divine Chocolate and Passion Fruit Truffles will be given as gifts. “As this is our second Valentine’s Day in Manhattan, I am so pleased to celebrate the love of food, sweets and each other and partner with Divine Chocolate,” said Emmanuel Verstraeten, Founder and CEO of Rouge Tomate. 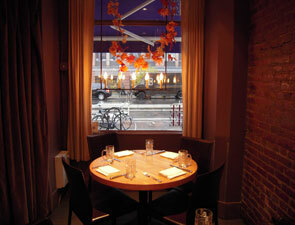 Rouge Tomate is also participating in NYC Restaurant week for Lunch and Dinner. Be a tiger this Valentine’s Day. It’s the Year of the Tiger, and Ben Pao is celebrating the Chinese New Year over Valentine’s Day weekend, Thursday, Feb. 11 through Sunday, Feb. 14 with traditional Chinese New Year menu items, a “Crouching Tiger, Hidden Aphrodisiac” Champagne and sparkling wine tasting, and the amazing and colorful Lion Dance which draws crowds yearly. For the individual events during the celebration please click here. Simon at Palms Place welcomes winery owner Francesco Kovarich and invites guests to sit down for an extraordinary wine dinner event featuring two organic Italian producers, Poggio Foco from Tuscany and Fattorie Azzolino from Sicily. 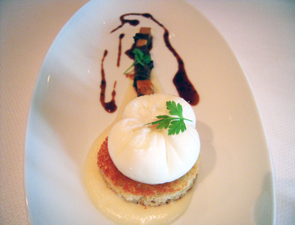 This special pairing will be held on Thursday, January 28 at 7 p.m. for $85 per person. Guests have the opportunity to enjoy stunning wines and inspirational, original fare. To start off the evening, the featured appetizer is hamachi sashimi with bacon avocado and yuzu kosho paired with Azzolino D’Incanto Grillo 2008, a crisp Sicilian white wine with citrus notes. The second course features a savory stuffed Maine lobster tail mousseline partnered with Azzolino Diletto Nero d’Avola 2008, a unique fruity and minerally “white wine” made from red grapes. Third course is a chicken cacciatore with Tuscan potatoes complimented by Poggio Foco Secondo 2005, a robust Italian Cabernet Sauvignon. The evening’s main dish is a wagyu flat iron bistecca, prosciutto, fingerling coins with wild arugula served alongside a Poggio Foco Sesà 2005, an elegant Tuscan red blend. This featured wine steps up the uniqueness as only 10,000 bottles were produced. To cap off the night’s dining experience, a decadent pairing of toasted Meyer lemon angel food cake with brown butter ice cream and Azzolino Dama Cortese, a rich dessert wine made from native, sun-dried Sicilian white grapes. Chef Kerry Simon incorporates a sense of adventure into his cuisine, and with these unique Italian pairings, this is a culinary experience not to be missed. 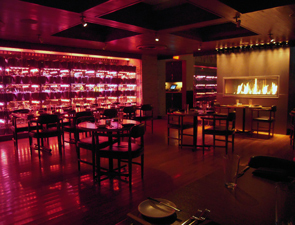 Reservations are encouraged and can be made by calling 702-944-3292. Mark Purdy, chef de cuisine at Alizé at the Top of the Palms has been utilizing the locally-grown products available from the farmer’s market to create a lower priced menu for our diners. This prix fixe is available 7-days a week; although the menu items can change daily, depending on what Chef Purdy has fresh on hand and has selected from the farmer’s market. 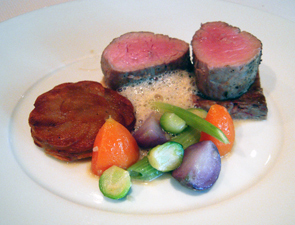 For a cooking demonstration or video interview with Andre Rochat (owner) please click here. from 16 foot floor-to-ceiling windows!